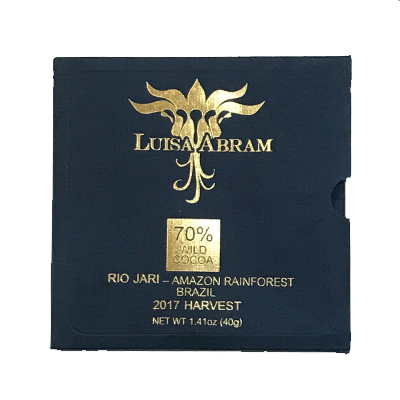 Luisa Abram is a chocolate maker that dedicates itself to sourcing micro-lot, wildly grown cacao from the Amazon Rainforest. 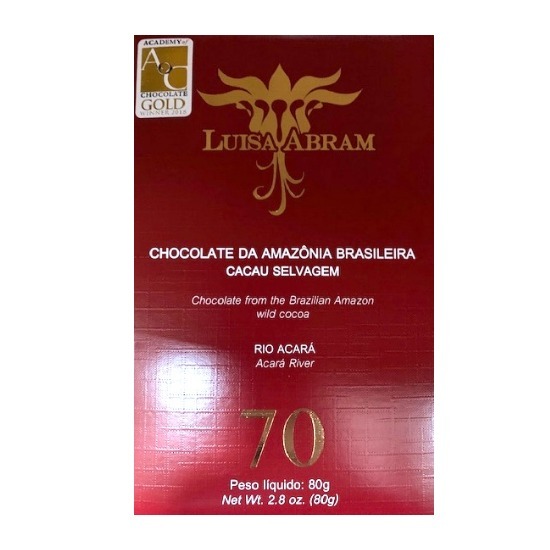 The chocolate is made small-scale in São Paulo, Brazil by the Abram-Banks family: Luisa, Andre, Mirian and Andrea. The family take a very hands-on approach to chocolate-making, controlling and overlooking every stage of the process, from the harvesting of the cacao to the finished bar and logistics. 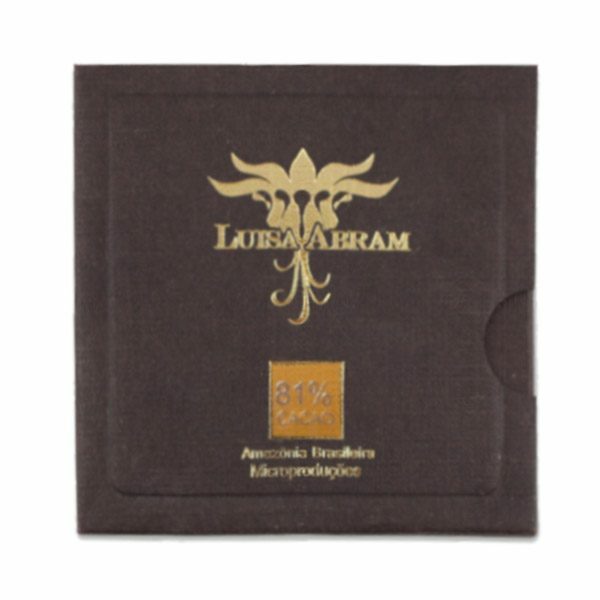 This explains why the chocolate tastes so good and so personal at the same time – quality is very important to Luisa Abram. 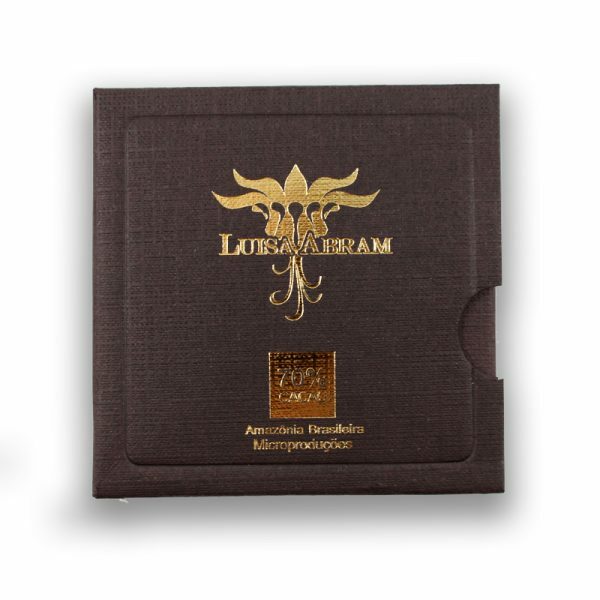 Luisa, the eponymous woman of the chocolate, values a commitment to quality in every stage of making a differentiated product. During fermentation, Luisa will often remove a handful of cocoa beans and cut them in half to see the progress of the fermentation. This is not so much a test that is strictly followed, but Luisa Abram likes to observe this amongst other tests – such as temperature of the mass and its aromas – all to aid the decision of when to stop the fermentation. Tests like this also allow Luisa to check the quality of the cacao. Cacao had once made Brazil the largest exporter of the commodity in the world; however, once plant-diseases such as ‘Witches Broom’ and ‘Black Pod’ attacked cacao, the production reduced significantly. The answer to overcome this was for farmers to grow hardier beans, typically of the ‘Forastero’ variety. This meant forgoing the growing and harvesting of diverse fine cacao varieties for instead rather mono-varietal, disease-resistant bulk cacao. 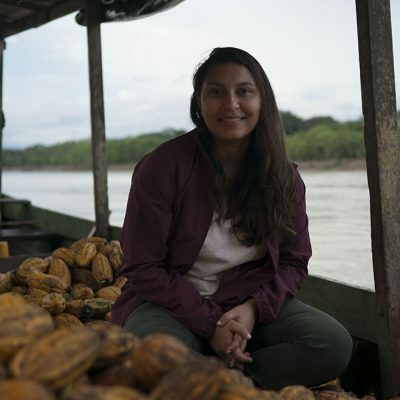 However, today, Luisa Abram’s vision is to restore Brazil’s fine-cacao industry. We are a family business. Everybody is involved, so that everyone’s skills contribute to the whole. There are four of us; Luisa Abram – who was born in Coventry, England. Luisa has just finished Culinary Studies in São Paulo, Brazil. She is our barsmith. She takes care of the tempering process to the packing of the bars. Then there is Luisa’s father; André Banks. André is a native Brazilian from the Northeast of the country with a PhD in maths from Warwick. He takes care of all the machines and does the cleaning, roasting and grinding of the cacao nibs. Mirian Abram is Luisa’s mother. She is also from the Northeast of Brazil, she takes care of the logistics and finances. Then there is Andrea Abram – Luisa’s older sister who has a Law Degree and helps with legal issues. Luisa always wanted to have her own business, and chocolate had always been an interest. Once she finished her degree, we started looking for options. We read many newspaper articles, magazines and webpages about competitive food products made in Brazil, made with raw material indigenous from here. We discovered that cacao is from the Amazon Rain Forest, which a large part of it sits in Brazil. Then we started looking for places where the locals collected cacao from the Forest in an organised way. After much effort and time, we found a co-operative that was doing a good job in collecting and fermenting wild cacao from the Forest. Moreover, the cacao is an important source of income to them, acting as a palpable incentive to preserve the Forest, since the cacao trees only grow and bear fruits under the shadow of bigger tress. We were really happy to meet such natural sustainable business model! We brought this cacao to Sao Paulo, made tests and were amazed with its flavour, creaminess and smell! We fell in love with that chocolate and the integration that came with it between the local communities and the preservation of the Rain Forest!! New beans for sure, focused on wild ones. The ones nature created many years ago in the Amazon Rain Forest. We aim for the world to eat our bars and enjoy them. Luisa: Tuna sashimi. Chocolate: Naïve 67%, and of course ours most definitely! Andre: Japanese food, Brazilian cuisine, Indian cuisine. Chocolate: Zotter Peru, Naïve 67%, Domori Canoabo, and ours most definitely!